Want to play protected M4V files on iPod, iPhone or QuickTime freely? First of all, you get to know something about iTunes movies and other videos. As we all know that, the purchased or rent movies / videos from iTunes Store are protected with DRM. And if you want to play the protected movies on MP4 or other video players, you need to remove the DRM protection so as to play them anywhere you like. All the DRM video and movies can only be played on Apple players, you need an apple m4v converter to convert protected DRM M4V to unprotected formats like MP4 / MOV / AVI / 3GP and so on. And then the unlocked movies or TV shows can be played on Sony PSP, Sony Walkman, iRiver, Kindle FireHD, Samsung Tablet and other popular player devices freely. M4V Converter Plus will be your best helper, to help you easily and quickly convert iTunes M4V files to MP4, and convert iTunes any video to MOV for iPod, iPhone, Apple TV. 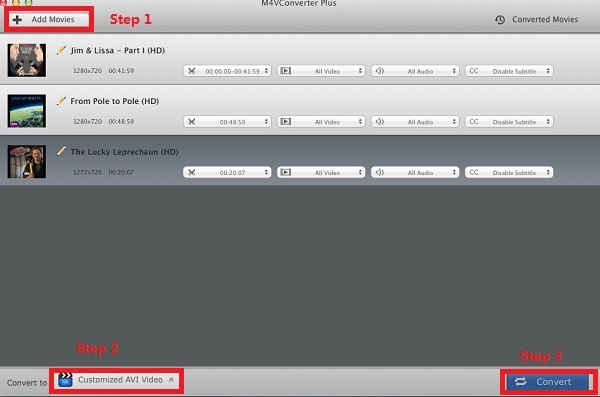 M4V Converter Plus is a powerful media converter used to convert any video on your iTunes library. It supports converting iTunes movie rentals. And the only condition is you can play the M4V rentals on the iTunes. It has optimized DRM Removal engine, and you can adjust conversion settings with your own style. It uses multiple-speed recording technology to convert protected videos to unprotected MOV, M4V or MP4 format. It has been designed to remove DRM to convert to be playable on iPod, iPhone, PSP, Zune. You can extract audio from all the popular iTunes movies, music videos and TV shows, so that you can enjoy movie music anywhere. Batch conversion is supported by this powerful iTunes video converter. You can creat a batch list of m4v video from library, and convert them all to a single selected format. It's very simple as well. It's a universal application, works on both Intel-based Mac and PPC-based Mac. It is very easy-to-use, just several mouse clicks to finish all the conversion and preview the whole process. MPEG-4 file extension used for videos downloaded from the Apple Store; includes TV episodes, full-length movies, and music videos; similar to an .MP4 file, but may be copy-protected using Apple's FairPlay DRM copyright protection. iTunes DRM files include AAC, M4V and M4P. If you don't remove DRM, it's impossible to play them on any Apple incompatible devices, like Zune, Creative Zen, PSP, mobile Phone, etc. To play a protected M4V file, your computer must be authorized with the account that was used to purchase the video. Unprotected M4V files may be recognized and played by other video players by changing the file extension from ".m4v" to ".mp4."